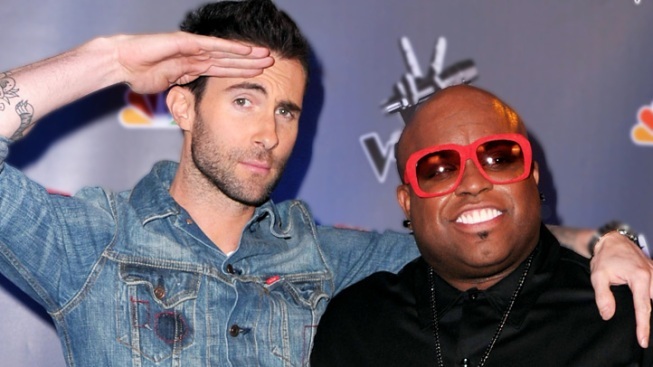 The Maroon 5 singer and "The Voice" judge is getting into a heated 140-character or less online fight. How can 140 characters cause so many problems? Maroon 5 singer Adam Levine took to Twitter to ask Fox News to avoid using his band's music during network broadcasts. Well, we're paraphrasing. "Dear Fox News," Levine actually wrote. "don't play our music on your evil f***ing channel ever again. Thank you." "The Voice" judge then began getting barraged from Fox News personalities Andy Levy and Greg Gutfeld. First, Fox News host Levy responded, "Dear Adam Levine, don't make crappy f***ing music again. Thank you." Then, "Redeye" host Gutfeld decided he needed to be involved, and began tweeting various bizarre and juvenile "jokes" aimed at the 32-year-old singer. "Why did Maroon 5 cross the road?" asked Gutfeld, before adding the alleged punchline. "Because crappy music is legal there!" When Levine, seemingly content to not get involved any further, tweeted the innocuous observance "just saw a plastic bag blowing in the wind.Pretty sure it's NOT the most beautiful thing I've ever seen," Gutfeld replied: "better than your music." Although this is not Levine's first controversial tweet, it seems as though the feud may be mercifully petering out.